In the spirit of Social Media Week 2013 in NYC, this week we are featuring Courtney Spritzer (CAS '09) who is a Co-Founder of SocialFly, a full-service digital marketing and PR agency. We first met her last December at the CAS Alumni Happy Hour at Linen Hall. Since then, we had the opportunity to talk with Courtney about her new venture, which capitalizes on the increasing importance of social media as a PR and marketing tool. Arts & Science Alumni Relations: Socialfly already has an impressive list of clients and testimonials. How do you find new clients? Courtney Spritzer: Networking, word of mouth, and of course, social media marketing has been key to our business. 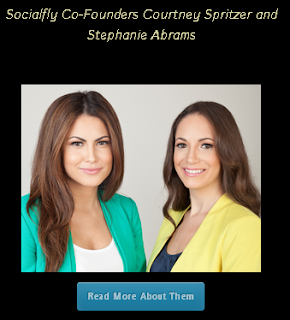 When Stephanie and I decided to leave our jobs, we had our operations in place, but only two clients. We immediately attended every networking event that we could and met as many people as possible. We would then connect with people on LinkedIn and keep a dialogue going. These people over time became our clients or introduced us to our clients. There is still a lot of skepticism about using social media for business. How do you convince wary clients that social media will help to grow their companies? The first thing we do is share all of the statistics and research available that proves how beneficial social media is for businesses. We further illustrate the tremendous positive impact a social strategy can have through case studies from our current roster of clients. Highlighting what we have already been able to accomplish for similar businesses can illuminate the benefit to the doubters. Do you have any personal blogs or social media pages? And do you find it difficult to separate your personal pages from your professional social media accounts? I am often asked this question by clients and explain to them that once they make the decision to use social media as a professional tool, they need to make a concerted effort to keep private pictures and information off the web! I use social media to share my thoughts and to connect with others. The only page that I keep private is my Facebook page. However, I don’t find it a challenge to separate my pages because I have nothing to hide! With the privacy settings available on many of the social sites, it is possible to keep your private life private, but you should always stay on top of the changing privacy policies of my many of the social sites out there. As it continues to evolve, what do you think will be the next “big thing” to happen in social media? People are obsessed with sharing pictures and the quick growth of instagram is a perfect example. I think apps like “Keek” and “Vine”, which stream real time short candid videos, will be the next big thing. In starting your own agency, have you come across any unexpected roadblocks? As expected, there have been a mountain of roadblocks that I have encountered as a young entrepreneur and I am still learning every day. I wouldn’t trade these challenges for anything, as they are what make my journey as an entrepreneur so exciting and force me to continue to grow and learn. The key to dealing with them is staying motivated and continuously believing in yourself. Surrounding myself with positive people and other entrepreneurs, who have faced similar struggles, has helped me tremendously as I have people to give me advice and bounce ideas off of. What advice do you have for other young alumni who are interested in starting their a company? Take the necessary time to evaluate and research your idea, get feedback from friends and colleagues to determine whether viable as a business. Create a business plan and outline how you plan to turn your ideas into a business. Success doesn’t happen overnight. Taking small steps today toward your goals will set the foundation for your future business! What was your favorite thing to do on the weekend as a student in NYC? On the weekends, you could easily find me shopping in Soho with my roommate. Separate from that, exploring and enjoying the LES with my NYU friends was always a favorite. But come Wednesday night, you could always find me down on Bowery Street at Phebe’s! Feel free to contact Courtney at courtney@socialflyny.com.